Zanders pointed out that a gas-fired power plant enables rapid changes of load, which will transform starting and stopping the paper machines into considerably more flexible and efficient processes. Aug. 23, 2018 - Zanders announced that it is in the process of converting the on-site power plant at the company's Bergisch Gladbach paper mill in Germany from hard coal to natural gas and is investing several million euros in the modernization of the mill. The conversion is part of Zanders' future-oriented investment program for sustainable increases in efficiency. The power plant conversion alone promises a significant increase in efficiency in the production processes of the paper mill. Zanders pointed out that a gas-fired power plant enables rapid changes of load, which will transform starting and stopping the paper machines into considerably more flexible and efficient processes as well as contributing to a longer service life of the systems. In addition, the previous coal-fired operation produced costs for the disposal of the ash —- an expenditure that will be eliminated completely, while efficiency will be further enhanced by a simultaneous reduction in the overall cleaning effort. Regarding the CO2 balance, Zanders expects a reduction in emissions of over 40 percent. "The conversion of two boilers in our power plant has mostly been completed. 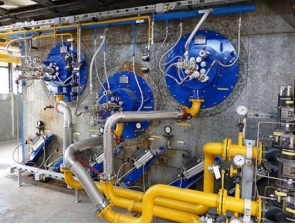 The gas has been flowing since the end of July and the commissioning of the first boiler is expected to be completed by the end of August, so that we will probably no longer need coal for the steam supply of our plant during normal operation by the end of September," said Ralf Wenz, the power plant manager at Zanders. "We are now preparing the conversion of the third boiler, which will take about a year. By that time, both main boilers and the reserve boiler, and thus the entire power plant, will be converted to gas," Wenz added. According to Wenz, the total investment will amount to around seven million euros. The conversion to gas represents the high point of a series of steps and measures to increase energy and cost efficiency in production in the medium and long term. These include the gradual installation of new LED lighting throughout the plant; the insulation of the steam pipes, as well as the optimization of the compressed air system. The Zanders mill houses two paper machines: PM 2 and PM 3 with a combined production capacity of 325,000 tons per year of specialty papers. Zanders is a German manufacturer of high quality specialty papers and boards developed especially for labels, packaging and graphical applications. To learn more, please visit: www.zanders.com.